As the volume of immigration has grown, the routes and patterns of migration have become more complex. Population movements today are not only circular and transnational but are increasingly sequential, involving more than one destination. This general trend is known variously as two-step, re-migration, or secondary migration. While the United States is not the only or even the final destination, it is one of the primary destinations of secondary migrants. Affluent countries that recently began to receive growing numbers of immigrants, such as the United Kingdom, Germany, and Japan, are increasingly serving as intermediary countries. Navigating ever more complex mechanisms to move, migrants often use these countries as a stepping-stone to the United States. Much research has mentioned this type of migration in passing — the "double-leap migration" of Jamaicans from the UK to Canada, the re-migration of Iranian refugees from Sweden to the United States, or the "spiral migration" of Chinese from Japan to the United States. Studies have also shown the growing re-migration of immigrants out of Canada, Australia, and Sweden. Relatively little is known, however, about the general trend and characteristics of this migration due to lack of systematic and comparable data. This article addresses the questions of who re-migrates to the United States and the prevalence of secondary migration. Although the data are limited, they show that secondary migration is part and parcel of migration to rich, immigrant-receiving countries today, and that the trend has numerous policy implications. A combination of available data forms the basis for this analysis, including the 2000 U.S. census, the New Immigrant Survey (NIS) from Princeton University (2003), immigration statistics collected by U.S. Citizenship and Immigration Services (USCIS) (2000), and visa statistics (multiple years). There are limitations to what can be learned from the available data sets. For instance, in the 2000 census, the key variable that allows secondary migration estimates is "the place of residence five years before." 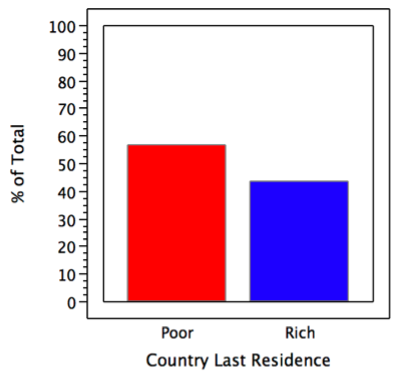 This variable, however, captures only recent re-migrants (although the majority, or 88 percent, of the foreign born surveyed had been in the United States for less than five years) and those who were residing in a third country (country other than their country of birth) at only one point in time. In other words, individuals who re-migrated to the United States before 1995 are not captured in the analysis. Immigration data from USCIS, as well as NIS, which draws its sample from the USCIS record, are also limited in that they only include migrants who obtained permanent residency. Thus, migrants in temporary status or many recent migrants to the United States are not included in the data. Visas statistics pose a different problem as these numbers do not easily distinguish between re-migrants and tourists. While many secondary migrants to the United States use a temporary tourist visa to get in (and later overstay their visa or adjust their status), there are also bona-fide tourists who apply for U.S. tourist visas in third countries. According to USCIS visa data, 12.5 percent of all immigrants admitted to the United States in 2000 (strictly speaking, those who adjusted their status to permanent residents) came from countries other than countries where they were born. That is, 12.5 percent of them resided in third countries immediately before coming to the United States. The 2000 census yields a similar number. Out of all the foreign born who were outside the United States between 1995 and 2000, 12.5 percent reported to be in countries other than their countries of birth. This census figure includes both direct secondary migrants (those who came to the United States directly from third countries) and indirect secondary migrants (those who returned to their home countries, or countries of birth, from third countries and later migrated again to the United States). Thus, it is difficult to discern direct and indirect secondary migrants using census data. 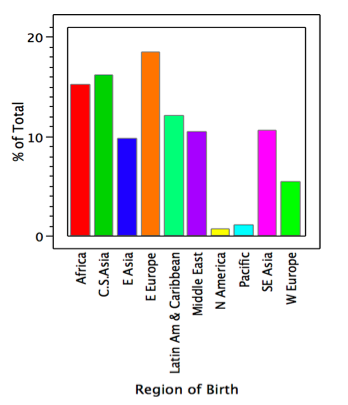 NIS data for 2003, however, show that while 9 percent of all migrants are direct secondary migrants who came to the United States straight from countries other than their countries of birth, an additional 6 percent are indirect secondary migrants who returned to their countries of birth before re-migrating to the United States as permanent residents. Altogether, according to NIS, 15 percent of all immigrants admitted to the United States in 2003 had experienced multiple migrations or resided in countries other than their countries of birth. While secondary migration mostly involves poorer countries both at origins and intermediary points, secondary migrants usually come from poorer countries and migrate first to richer countries before migrating further to the United States. This tendency, however, varies by region of origin and type of migration, such as refugee or skill-based migration. 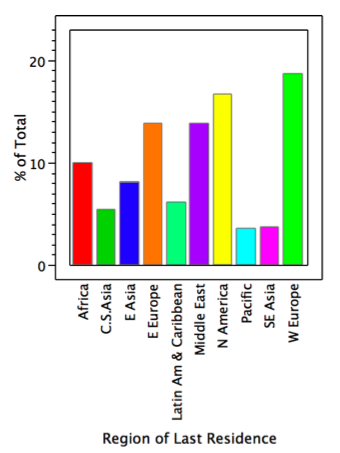 Overall, according to 2003 NIS data, secondary migrants to the United States were born in Eastern Europe, Africa, Central and South Asia, Latin America, and the Caribbean (see Figure 1), whereas the regions where most of them last resided immediately before coming to the United States are economically developed areas, such as Western Europe and Canada (see Figure 2). India was the leading sending country of secondary migrants, followed by China and the Philippines, while the major countries that served as intermediary points were Canada, the UK, Germany, and Israel. By breaking down countries of birth and last residence into levels of economic development — "richer" countries are the top 30 by GDP per capita in 2003 — one can see the trend of secondary migration movements more clearly (see Figures 3 and 4). While over 90 percent of secondary migrants originate from poorer countries, only 55 percent came immediately from poorer countries before arriving in the United States; the remaining 45 percent migrated first to richer countries. Therefore, while poorer countries overwhelmingly supply secondary migrants, richer countries tend to serve as intermediary countries. Among richer countries, the country that most often serves as an intermediary point is Canada. As some previous studies have shown, growing numbers of immigrants in Canada migrate to other countries. Migrants from Hong Kong and India, for instance, may move first to Canada and then on to the United States. The patterns of second-migration moves, however, vary somewhat by region. For those secondary migrants originating from (or born in) Eastern Europe, their last residence is mostly within the same region; most of them, therefore, migrate first to a nearby country. For example, a Bosnian-born person may move to Germany before migrating again to the United States. Similarly, migrants from Africa, Latin America and the Caribbean, and the Middle East make mostly intraregional moves. Some Somalis migrate first to their neighboring country, Kenya; within Latin America, South or Central Americans may go to Mexico before reaching the United States. For those born in Central and South Asia, the pattern is different. Here, the top regions of last residence are North America and Western Europe. A native of Hong Kong may migrate first to the UK and then on to the United States. East Asians who re-migrate tend to move first to Western Europe, North America, the Middle East, or to another country in the region. The regional variation is, in part, attributable to the fact that migrants use different types of visas. 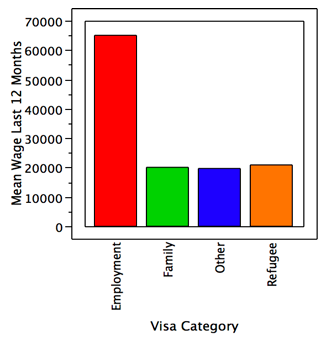 Some re-migrants enter the United States as students or cultural-exchange visitors while others come as fiancés of U.S. citizens or as high-skilled H-1B workers. Refugees tend to move within the same region before migrating to the United States, and they tend to originate in, and immediately come from, Eastern Europe, Africa, and the Middle East. In contrast, skill-based migrants tend to originate in South/Central Asia, East Asia, and Southeast Asia, and are more likely than refugees to migrate from Western Europe and Canada. Family-sponsored secondary migrants admitted to the United States are largely from Latin America and the Caribbean, and they demonstrate relatively few interregional movements. Employment-based migrants are more likely than family-based migrants and refugees to move to richer countries first before migrating further to the United States. Also, they tend to move more interregionally, rather than within a region (e.g., Indian-born, high-skilled workers move first to the UK before migrating to the United States). This trend among employment-based migrants is particularly salient among migrants who resided in more than three countries prior to their U.S. arrival. According to NIS, 35 percent of those who migrated to two or more intermediary countries entered the United States on the basis of skills while 33 percent were in other visa categories, such as company transferees and students. A smaller proportion of them were refugees (13 percent) and family-sponsored migrants (18 percent). In short, skill-based migrants tend to be highly mobile geographically. Compared to one-time migrants, who migrate directly from their countries of birth, secondary migrants in the United States tend to have two distinct characteristics. The first is their modes of entry. A greater proportion of them enter as refugees or as employment-based workers than one-time migrants. While most one-time migrants migrate via family sponsorship (40 percent) or other routes, according to NIS data, secondary migrants are more evenly divided between visa categories, with the highest proportion — 30 percent — entering through employment sponsorship. Second, re-migrants as a whole are highly skilled and educated. The mean number of years of formal schooling among secondary migrants is 14.3 compared to 12.5 years for one-time migrants, according to NIS data. 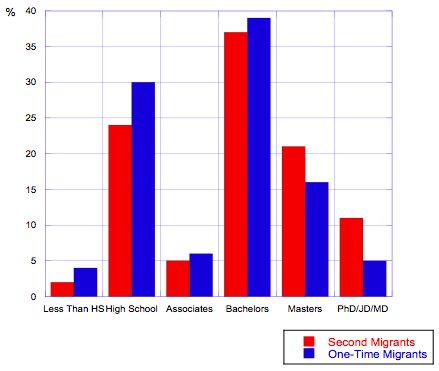 Likewise, a greater percentage of secondary migrants completed graduate degrees (see Figure 5). The 2000 census shows that 51 percent of secondary migrants had acquired some higher education as opposed to 31 percent for one-time migrants, and 15 percent of secondary migrants hold a post-graduate degree, compared with 8 percent of one-time migrants. Similarly, secondary migrants are more likely than one-time migrants to engage in professional and skilled occupations and have higher earnings than one-time migrants (see Figures 6 and 7). 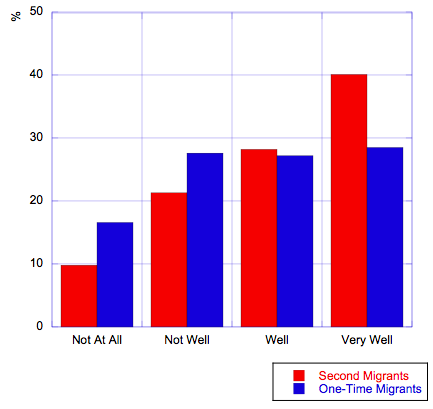 Secondary migrants also claim to be more fluent in English (see Figure 8). 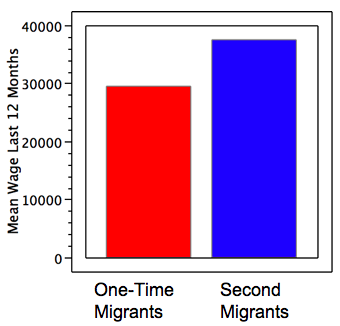 The relative socioeconomic advantage of secondary migrants is particularly noticeable for those who enter the United States on the basis of employment. Skilled-based migrants have particularly high levels of educational attainment and earn more (see Figures 9 and 10). 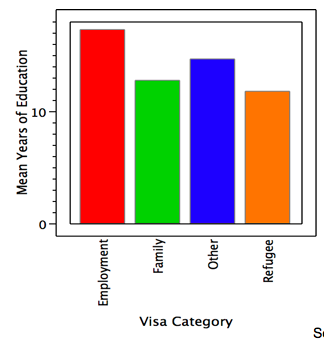 Moreover, multiple secondary migrants, who migrated to two or more intermediary countries, have even higher levels of human capital than other secondary migrants on average; they are particularly well-educated (15.7 years of schooling), highly skilled, and earn higher levels of income than other secondary migrants. 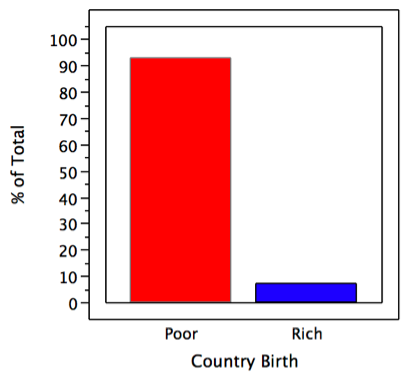 Demographically speaking, the two types of migrants are more comparable. Secondary migrants, at an average of 33 years old, are slightly older than one-time migrants (28 years old) and are more likely to be married with spouses present (45 percent versus 35 percent for one-time migrants), according to 2000 census data. Both types of migrants are almost equally divided between the two sexes, although a slightly higher percentage of one-time migrants are female (52 percent versus 47 percent). Settlement patterns, also determined using 2000 census data, are similar between the two types of migrants as well. They are concentrated in states that receive large numbers of immigrants in general: California, Texas, Florida, New York, and New Jersey. Over 90 percent of both groups reside in metropolitan areas. Overall, secondary migrants, compared to one-time migrants, tend to be slightly more established with more work experience. These traits, together with their greater likelihood to be male and married, may partly explain their higher levels of income than one-time migrants. Secondary migrants are far from homogeneous. They come from a variety of regions and re-migrate to the United States via different routes and means. Those who re-migrate as refugees tend to come from Eastern Europe, Africa, and the Middle East and have lower average levels of education than their skill-based counterparts, many of whom originate from South Asia, East Asia, and Western Europe. In general, secondary migrants are better educated and engage in skilled and professional jobs in greater proportion than one-time migrants. As international migration continues to grow in its volume, frequency, and complexity, secondary migration has become more salient, partly as a product of extensive migrant networks, and partly due to changing immigration policies of many immigrant-receiving countries. Wealthy destination countries have made their immigration policies more restrictive while, in many cases, allowing for high-skilled migration. Migrants from poorer countries with lower levels of skills and resources can find it especially difficult to enter such countries. Consequently, migrants of all skill levels have used a variety of means to get to their preferred destinations. One way to do so is secondary migration. Countries that may be easier to enter then become a stepping-stone to migrants' final destinations. Canada is a case in point. For some migrants it may be easier to obtain entry visas to Canada than to the United States from their countries of origin; here, Canada serves purely as a stepping-stone. It is also possible that, after experiencing life in Canada and gaining Canadian citizenship, they decide to seek better fortunes in the United States. In a world where human capital, just like financial capital, has become more mobile, owners of human capital may migrate multiple times to seek the highest return. Thus, secondary migrants would be richer in human capital than those who only migrate to one destination. Whereas primary migration involves the mobility of labor, secondary migration more involves the mobility of human capital. If secondary migration is, in fact, directed toward a selected number of final destinations, such as the United States, and if this migration involves individuals with high levels of human capital, this trend may have significant policy consequences for countries that increasingly serve as intermediary destinations. While debates over immigration in immigrant-receiving countries have tended to focus solely on people coming in from poor countries, it is equally important for such countries to understand why foreigners leave, particularly when they try to lure and retain the educated and highly skilled. Indeed, today's preferred destination for secondary migrants may become tomorrow's stepping-stone. The race for secondary migrants will likely heat up as wealthy countries seek both to compete in the globalized economy and to revitalize their ageing and shrinking populations. This research was carried out as part of a larger project with support from the Abe Fellowship, offered by the Japan Foundation Center for Global Partnership through the Social Science Research Council and a research grant from the Lindback Foundation. The New Immigrant Survey, on which the research is partially based, is a research project designed by G. Jasso, D. Massey, M. Rosenzweig, and J. Smith, and funded by NIH HD33843, NSF, USCIS, ASPE & Pew. Monica E. Higgins helped me get acquainted with the data set, and Samar Khatiwala provided assistance with data analysis. I am also grateful to Douglas Massey, who provided comments on the research project. Beenstock, Michael. 1996. "Failure to Absorb: Remigration by Immigrants into Israel." International Migration Review. 30(4): 950-978. Castles, Stephen and Mark J. Miller. 1998. The Age of Migration. New York: Guilford Publications. DeVoretz, Don J. and John Ma. 2002. "Triangular Human Capital Flows Between Sending, Entrepot, and the Rest of the World Regions." Canadian Studies in Population. 29(1): 53-69. Devoretz, Don J., John Ma,, and Kenny Zhang. 2003. "Triangular Human Capital Flows: Empirical Evidence from Hong Kong and Canada," pp. 469-492 in Reitz, Jefffrey G. (ed), Host Societies and the Reception of Immigrants. La Jolla: Center for Comparative Immigration Studies. Edin, Per-Anders, LaLonde, Robert, and Aslund Olof. 2000. "Emigration of Immigrants and Measures of Immigrant Assimilation: Evidence from Sweden." Available online. Graham, M. and Khosravi, S. 1997. "Home is Where You Make It: Repatriation And Diaspora Culture among Iranians in Sweden." Journal of Refugee Studies. 10(2): 115-133. Iqbal, Mahmood. 2001. "The Migration of High-Skilled Workers from Canada to the United States: The Economic Basis of the Brain Drain," Pp. 291-323 in The International Migration of the Highly Skilled: Demand, Supply, and Development Consequences in Sending and Receiving Countries, edited by Wayne Cornelius, Thomas Espenshade, and Idean Salehyan. La Jolla: Center for Comparative Immigration Studies. Nekby, Lena. 2004. "The Emigration of Immigrants, Return vs. Onward Migration: Evidence from Sweden." Available online. Newbold, Bruce and M. Bell. 2001. "Return and Onward Migration in Canada and Australia: Evidence from Fixed Interval Data." International Migration Review. 35(4), 1157-1184. Ayumi Takenaka is an Associate Professor at Bryn Mawr College. New Research Challenges Notion of German "Brain Drain"